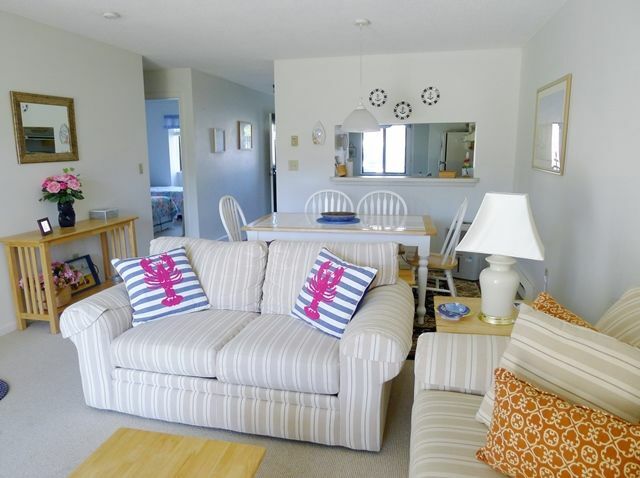 This street level garden villa in the Eaton Village section of Ocean Edge Resort accommodates 6 guests has a definite beachy feel, and is located within walking distance to Fletcher or Arbor pool complexes as well as the tennis courts and the Linx Tavern. The nautical décor in the air-conditioned living and dining area is an inviting place to relax. The main bedroom features a queen bed, ensuite bath with a shower/tub combination, and cable TV. The second bedroom includes two twins and there is another full bath with a tub/shower combination across the hall. Through the sliding glass doors in the living room, you can sit on the patio and watch the sun set on the golf course beyond the trees! Also included: washer/dryer, parking for 2 plus cars, WiFi, gas grill, patio dining furniture. DO YOU HAVE TWO GROUPS WHO WANT TO VACATION "TOGETHER BUT SEPARATE"? ASK ABOUT ALSO RENTING 96 EATON RIGHT NEXT DOOR!! Guests of this home will have Ocean Edge privileges except access to the private beach area. The resort charges fees to use these amenities which will include the use of Fletcher indoor & outdoor pools, Fletcher cardio room, Arbor outdoor pool, the New Fitness Center with outdoor pool, and Tennis courts. This home does not include Golf privileges You must complete your OE guest list and submit it to our office 10 days prior to your stay in order to have privileges. Remember all Ocean Edge fees are to be paid upon arrival to Ocean Edge. Here at CapeCodRentals .Com our agency works exclusively with rentals, so we devote all of our resources and attention to helping guests find exactly the right home. We strongly believe in using new technology to be able to provide old-fashioned, hands-on service to both our vacationers and our homeowners. Our staff of tenured specialists are long term residents of Cape Cod and can find you the perfect rental AND recommend nearby restaurants, beaches, must-see destinations, and fun things to do in the area. We offer 24/7 Emergency and after-hours service as well as inclusive cleaning service using natural products. We love what we do and are wholly committed to enriching the rental experience for all! toilet, combination tub/shower, en-suite off Queen bedroom. We had a great week at Ocean Edge. 92 Eaton met our basic needs for a cape vacation and Ocean Edge resort, pools, activities and Brewster location for bay and ocean beaches is great. However, the condo could use some much needed updates. When we arrived we noticed there were two humidifiers and many air fresheners placed throughout. The condo had a damp feel and the dehumidifiers were very needed and the basins would fill and need to be emptied at least 1-2x/day. Also, the master bedroom mattress is in much need of replacing, it was very uncomfortable, could feel the springs and it was clear it was very old. The two TVs are relics - it reminded me of watching TV as a kid in the early 90s. The cable for the TV in the family room also stopped working day 2- this did not harm our vacation since we were rarely in the condo but it would have been nice to have a proper working TV. Pots/pans were also very old and made cooking/clean up difficult. Overall kitchen is very dated and rust could be seen on the fridge although despite appearances all appliances did work. Also, there was an ant issue in the kitchen - there were ant traps in the condo when we arrived and we had to spray/clean up ants several times during the week. There were also area rugs and rug runners placed over wall to wall to carpet that would not lay flat, kept bunching up and were overall awkward as you walked through the condo. Lots of room for improvement here.